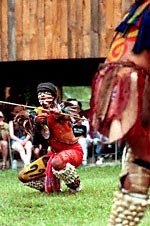 In the third year Javier returned to the Trade Days Festival, he introduced a dance which was old when Columbus first set foot on this continent. The Deer Dance. This one in particular has grown to be a favorite, drawing large crowds each time it is performed. On the lower grounds, left, crowds gathered in a large circle to see the dances performed by Javier. Miguel Angel Marroquin, right, portrayed the hunter with tremendous beauty. 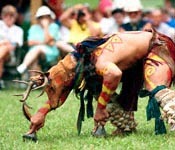 I have seen Javier perform the deer dance many times and his transformation into the spirit of the deer is always awe inspiring. Many people have closed their minds and souls, hardened their hearts and do not see the true beauty and honor of the dance. They believe this to be some form of pagan animal worship. Unlike most 'modern' religions which have a concept of the Creator (God) as some large being looking down on us from on high, this dance, as with all facets of their lives, honors the Creator's spirit which is seen in all living things. 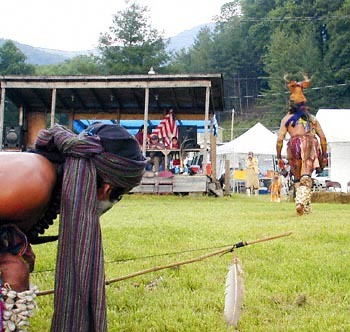 The dance gives thanks to the Creator and honors the spirit of the deer and the sacrifice of its life to feed and clothe the tribe. Before each of his performances, unknown and unseen by most, Javier offers a prayer to the Creator, giving thanks for his gifts and talents and the opportunity to share them with others. 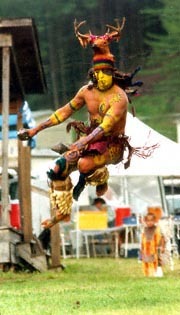 The tremendous energy exhibited during his dances is evidenced as he leaps, seemingly effortlessly, high into the air and moves with such grace and beauty. The dance ends as does the hunt. A kill is made. 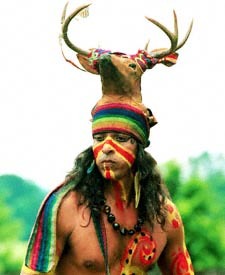 The hunter honors the deer's spirit - a manifestation of the Creator, which has roamed the forests, grazed on lush grass and drank pure water, all in balance with the earth. 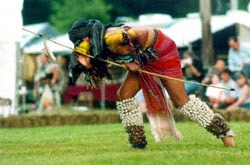 The hunter thanks the Creator for the gift which will sustain his tribe, his family.